On Tuesday at the Serious Offences Court, Chief Magistrate Sonya Young found that there was sufficient evidence laid against the accused for the matter to be heard at the highest court. 32 prosecution witnesses were called to the stand to give evidence. Quammieâs body was found hanging over a cliff on April 24, 2007 around 2pm after her husband had reported her missing on Monday April 23, 2007. 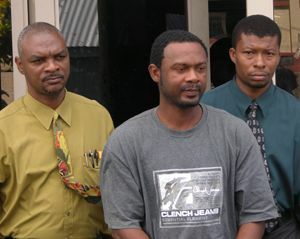 Lawyer for the accused, Arthur Williams made a no-case submission on behalf of his client on the grounds that the prosecution had failed to prove their case and that there was no evidence to show that Quammie murdered his wife. The attorney further noted that if the prosecution collected more evidence against the accused that they could always charge him at a later date. In responding to Williamsâ submission to the court, Inspector Butcher pointed out that the history of Quammieâs abuse of his wife and his conduct around the time of his wifeâs death provided enough evidence for him to stand trial before the High Court. At the time of her death, Kemlon Johnson-Quammie was a Registered Nurse attached to the Levi Latham Health Centre at Mespotamia.